In hindsight, I should have ordered about double the amount of copies, but it’s been rare that I’ve completely sold out of an item the first show I bring it to, and I was uncertain how Gentleman Cthulhu would do. To say the least, I’m quite happy the book sold so well and that many people continued to come up to the table and both ask about and flip through the display copy (I kept one for this purpose), especially because (though I know many people enjoy this comic) it’s still just a fun side project for me. That said, if I was sold out before you came to my booth or if you weren’t at the show at all, fret not. I plan to make the book available through online sellers, and I will continue to have it available on my table at future shows (which I won’t resume again until 2017). Though be patient. It may take a little bit of time to put this all in place. I’m considering my options for distributing Gentleman Cthulhu, as I’ve only used Ka-Blam and its related IndyPlanet in the past for printing and selling my Chadhiyana #0 online. I would like to see how DriveThru Comics works as well as possibly comiXology. 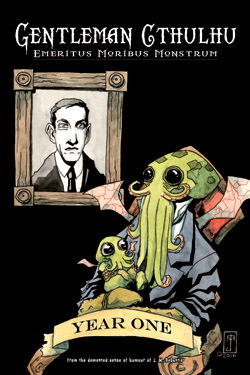 And, again, as Gentleman Cthulhu is my “side project” I can’t promise I’ll be quick about it. Though I am considering offering my mailing list subscribers a special offer on the book especially because so many people signed up for the mailing list at New York Comic Con based on the book being sold out. Likely I’ll make the offer before the book is available online (though Ka-Blam may upload it to IndyPlanet before I can make the offer). So if you really want a copy, especially if you want it signed (that will be part of it), enter your e-mail address into the mailing list box in the sidebar of this site. My next mailing will likely go out by the end of next week. In the meanwhile, keep reading, as I continue to enjoy writing and drawing this bizarre little comic.